Hop! is a delightful family friendly board game of dexterity and strategy. Each player is a child who is trying to reach the top of the sky! On your turn you must throw a rainbow to another player, who must catch it using only their index finger - but there's always a twist! Perhaps the catcher must stand on their chair - or you as the thrower can only use your elbow. Or a third player is standing behind you making distracting noises at opportune moments! 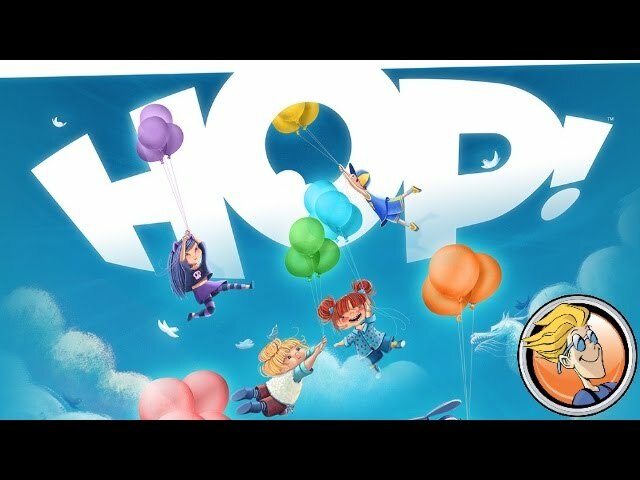 Playing Hop! is no easy task, especially if your balloons go POP at the wrong moment! If you're helpful, you can earn cloud tokens which give you extra points - but choosing who to help is a strategy in itself! Buy Hop! if you're looking for a light, beautiful game with plenty of laughs and important decisions.